The BCD (Library and Documentation Center) of the Lycée Français Jules Verne has more than 25 000 books (Albums, Novels, Comics, Documents, News, Plays, Magazines). 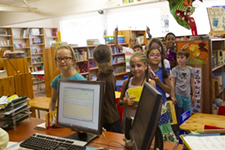 They are all registered with the “BCDI” system, which makes it possible to quickly locate each book by title, author or subject, as well as the management of loans by children. 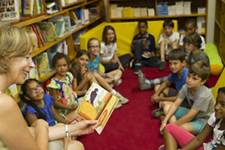 It welcomes all the children of the Primary classes and, since the school has extended to bilingualism, children borrow books, albums and magazines, at the weekly rhythm, in both French and English language. These moments of learning allow pupils to develop the search for information, autonomy, curiosity, reading and oral expression.